And it pretty much never went away. didn't listen to my very sound advice. I discovered the movie Lockout when the preview played on a dvd, but I found the gifs really applicable for Nik & Hanna. I actually love Maggie Grace as a fancast for Hanna. She's pretty and princessy (see Lost and Taken) but when push comes to shove, she can be tough and get the job DONE (see: Lockout and Taken 2). Nik really does smoke. Don't smoke, kids. Also Hanna wears a suit like that. Sort of. Jay Kristoff is the award-winning author of The Lotus War trilogy, a Japanese-inspired steampunk fantasy. Part 3, Endsinger, is out now. 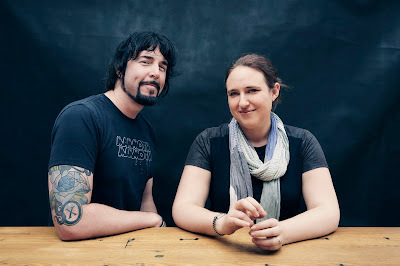 He's also co-author of the upcoming Illuminae (with Amie Kaufman), a YA Sci-Fi... thing, to be released by Knopf/Random House in 2015, and Nevernight, the first part of a new fantasy trilogy kicking off in 2016. Jay is 6’7 and has approximately 13380 days to live. He abides in Melbourne with his secret agent kung-fu assassin wife, and the world’s laziest Jack Russell. Open to US & Canada. Entrants must be 13+. Giveaway is open until 12 AM CST August 9. I reserve the right to disqualify any entries that are not in accordance with my giveaway policies as stated in the Review & Site Policies tab at the top of the page.Good luck! I have Illuminae and plan to read it soon! I hope you love it. It's one of my absolute favorite series EVER. I don't really have a favorite character. I just love love love this book. It is so unique. Cannot wait to read Gemina!! Thank you! I had SO much fun finding the perfect set to describe my feels! Mmm, I love Kady and how intense and strong she is, she impressed me at every turn through the story! Agreed! Kady is a total BAMF. Um...I haven't read it yet. But I keep hearing about it and now I have to. READ IT READ IT READ IT READ IT READ IT! I mean, whatever. Up to you (DO IT). *SPOILERS* I forgot to put that on the initial comment haha! Ezra and Kady definitely tie for my favorite characters, but I think AIDAN might be the favorite, for the sheer insanity and cleverness of that "character". I'm excited to explore more characters in Gemina, maybe meet some survivors of the attack on Kerenza, and for Kady to make good on that threat to Ezra's mom Leanne. I AM READY. KADY I WILL HELP YOU. God I love this book. Also this non-spoilery review had me DYING of laughter but also SO CURIOUS. I cannot wait for this book, I am so impatient haha. I promise if my review made you die of laughter, Gemina will too. But it will also, you know, destroy you and rip your heart out. I love AIDAN too! His snark is A++! AWESOME REVIEW! I loved AIDAN in Illuminae. Is that weird? Probably. He was devious and had that odd fascination with Kady that totally threw me for a loop. 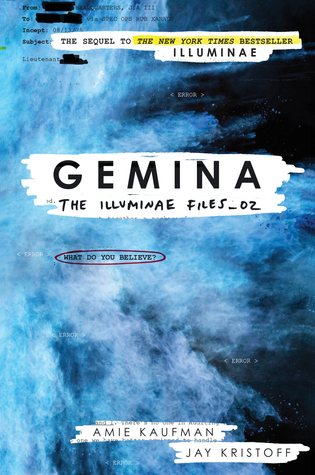 I'm so lost after Illuminae, I just want Gemina in all its devastating glory! Not weird at all. Or, if it is weird, at least you're not alone. AIDAN and Kady are one of my favorite (non-romantic) ships. They have great chemistry. These GIFs are amazing. Makes me excited (and scared...mostly scared) for Gemina. Will we see AIDAN and group, though??? That's what I want to know! But Kady HAS to be my favorite. SO SASSY. I can't wait to meet them allll. Not a spoiler because Amie and Jay have said so, but anyone who survived Illuminae is in Gemina at least a little bit. Kady's sass gives me life. Also, I'm glad you're excited but mostly scared for Gemina. Scared is good. It means you're keeping self-preservation in mind. That's important. Haven't read it, which is why I need it lol! I have Illuminae but haven't read it yet! So I don't know yet who my favorite character is. I haven't had the chance to read the Illuminae series yet, but I am so excited to do so! I haven't read this series yet, but now that there's an exciting sequel, I've got to start or miss out! Go get a copy ASAP! I'll wait. Ezra and Kady together <3 *swoons* Trust me; you're gonna love Hanna and Nik just as much. They also have A+ chemistry and snark. Want to read illumnae so badly. okay, to be honest, I wasn't sure how this would would stack up against the first, but those gif reactions got me interested! Hanna seems like she'd be feisty! Also had no idea there was gonna be a 3rd book. 1. I didn't love Gemina QUITE as much as I loved Illuminae, but that's because after reading Illuminae like four times, I have Amie and Jay *sort of* figured so some of the big twists I was able to figure out, and I wanted a bit more surprise. But it's still AMAZING. 2. Hanna is VERY FEISTY. 3. YES! It's a trilogy! I've seen these books around the blogsphere, but haven't ever really known what they are about. Your reactions have deemed the books interesting enough that I should put the books on hold! Thanks for the (spoiler free) review! SPACE AND FAMILY AND TECHNOLOGY AND ROMANCE AND MURDER AND AIR-BORN PATHOGENS AND ANGST. I'm happy to help! I like to save spoilers for after a book is released. I'm certainly not going to share details when so many people haven't read the book yet! I got the ARC at AASL and have been a bit scared to read it because it wasn't sure it would measure up to the first. Plus I had heard the audiobook for the first book was amazing and kinda wanted to listen to this one. However, so many people are saying this book is better than the first. I guess it'll be moving up my TBR! I guarantee the audio will be just as good as Iluminae, but I recommend reading AND listening to the audio because you miss stuff if you just read or just listen. Like the book has all that gorgeous art the audio can't reproduce, but the audio has multiple narrators and glorious effects. Do both! I CANNOT WAIT to get this book. I recently read Illuminae for the first time and it was the coolest reading experience I've ever had! Gemina is just as cool, but I can't wait to see Marie Lu's final illustrations! Lol!! This whole post was exactly how I felt while reading Gemina! So accurate! Thanks! It was so much fun finding the perfect GIFs for each scene or reaction.